You can browse our selection of holiday accommodation below via your specific requirements. You can also email us with your requirements and we can recommend the best options for you based on what you want. All of our staff have visited Mallorca so please feel free to speak to us if you need help deciding. Boasting 554km of coastline and an average of 300 days sunshine a year, Mallorca is the ideal holiday destination. Our range of holiday rental accommodation is as diverse as the island itself; from picturesque fincas and fabulous farmhouses to modern luxury villas for rent and seaside apartments. This beautiful island has something for everyone with its stunning beaches, scenic walking trails, delicious gastronomy, wonderful mountain landscape, fascinating culture and so much more. Mallorca makes an enchanting destination, rich in cultural and historical heritage, alongside a plethora of scenic landscapes and beautiful beaches. Perhaps the most popular area in Mallorca attracting both families and couples alike is Pollensa, located to the north of the island. Haven on Earth has handpicked properties in this area and the surrounding region including Puerto Pollensa, Alcudia, Cala St Vincent and Formentor due to the magnificent landscapes, stunning beaches and breath taking scenery found here. 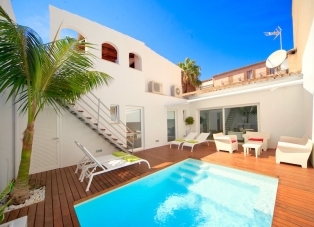 The island of Mallorca is extremely diverse and this is certainly reflected in the wide range of villas and apartments available for rent here. The bustling and lively capital Palma is the only real city in the Balearics and definitely worth a visit, with its imposing gothic architecture, a fabulous harbour and lively nightlife. Holidaymakers who are renting villas in the Pollensa area will generally fly into Palma Airport which is serviced regularly from many UK airports via low cost airlines. From Palma, the distance to the holiday villas in Pollensa area is about 60km and an easy drive or taxi ride. While in places there is the same 18-30s culture and commercial tourism similar to that of the Costa Brava, Haven on Earth has found that the North of the island around Pollensa is the perfect location for a relaxing family holiday away from the more commercial tourism seen in other parts of the island.